You don’t have a laptop or computer near you and you have to do some conversion of file format or you have to download a torrent file or any other thing which is very hard to do on a mobile due to lack of software, lake of format or lack of quality then don’t feel bad , You can do these all type of things with some other third party online resources and also without any cost even without your PC or laptop. Here we present six online tricks for smartphone and after reading and using them you don’t need a PC or Laptop for these types of small things. Torrent is a protocol based peer to peer File Sharing technique that is used to delivering high quality large amounts of data over the internet. the torrent is used for distribution of any type of files.A number of colleges and places like office,school don’t allow user to download any file from torrent sites or use any torrent clients because some pirated files like movies,software and music also stored on torrent sites. But There are some cloud services that allow you to cache torrents file directly in the cloud. Once the torrent content is available in cloud storage, you can easily download them from regular browser to your computer or Smartphone. One of The best website for downloading torrent without any client is Zbigz . Zbigz offers 3 types of file storage services. The Free version allows you to download files with resume capability. Free registered users get a personal account, to keep track of their downloads. Free service offer limited storage less than 1 GB, download speed 150KBps and maximum 2 simultaneous download. To unlock these restrictions and more features, users should upgrade to premium account. Following 3 are also similar Storage sites you can also give them a try. following are two well known website which will do it for you without any cost. File format conversion is not very easy on the smartphone.I tried some app from play store but they have very few file formats and also some are focused on a single file type. So i searched on the net and found some very good website that are able to convert document in any format,almost 40+ file format supported on them.So below are some well known document Converters. There are Many tricks for Google is present on the net and this is one of them by this trick you can find the direct download link of any movie in any format. After searching open any link and find the desired movie and download it. One of the best websites for this purpose is Web-Capture.net. You just have to Give the website link to this free online tool and it will capture the entire page and convert it perfectly in the image format of your choice (JPEG, TIFF, BMP, PNG, PS, and even SVG).It’s a terrific resource for everything from archiving articles, to sharing format-heavy content, to capturing examples for design ideas. It’s fully cross-platform, simple to use, fast, and free. And you won’t have to log in. 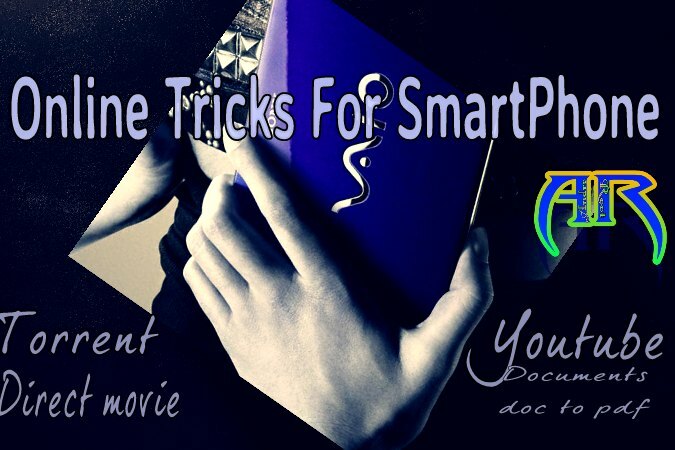 So I hope that our this post tricks for Smartphone Usere will definitely help you to solve some of the basic problem with your Smartphone due to lack of Available apps and resources.like Downloading torrent without any laggy torrent client or conversion of documents.For more tips and tricks ,Guides and tech news keep visiting. If you have more Online tricks Feel free to comment and share with other.